If you are running a fleet of taxis, this can be stressful as most taxi companies are open all year round, there is no time to stop and think. Arranging Insurance for a fleet of taxis can be a challenge and here at Goldcrest we help to eliminate the stress and the time by taking on the quote. Goldcrest use a wide range of insurers which allow us to explore the market and get the most comprehensive policy for your business at an affordable price. Whether you operate a public hire or private hire taxi firm, you will know that keeping track on the individual vehicle renewal dates can be difficult. With a taxi fleet policy all these vehicles will be insured under one policy, rather than several installments a month and several renewal dates a year, one key benefit is that there is only one. This is less time consuming and easier to administrate, perfect for a taxi firm. Here at Goldcrest we can tailor a quote depending on the type of taxis you own, London black cabs can be insured under a single vehicle policy while private based firms may need a mixed fleet. Private taxi firms may have different vehicles for instance you will have a normal 5 seated car, or you may have a couple minibuses to transport small groups to and from airports. As you are aware there are many of factors which can influence the price of the premium, area has a huge impact on the premium. For example companies that work in London, Liverpool, Manchester and other cities will be looking to pay more than companies in small towns. You may also wish to add breakdown cover as most of the drivers will be looking to drive tens of thousands miles a year. 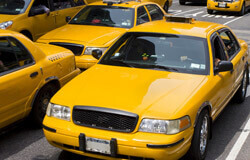 The type of cover is vital for taxi firms as you will need a comprehensive scheme which can offer a courtesy car. In an event of an accident the drivers are still able to work whilst their current vehicle is being repaired. If you are a taxi firm with more than 4 vehicles then you qualify for a taxi fleet, please contact us today for a free quote.